Based on John Wesley's journals, this Christian Drama records the incredible spiritual journey of this Christian figurehead. Watch one man's transformation through the discovery of God's grace which changed a nation. Wesley DVD is an award-winning feature film directed by John Jackman. 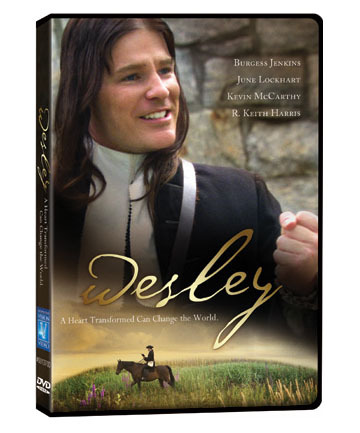 Wesley DVD Steps into eighteenth-century England and experience the transformation of one man whose heart-wrenching search for peace haunts him even as he pours himself into a life of service and evangelism. For the first time, Wesley's fascinating spiritual struggle is presented, based on John's own private journals. The young John Wesley worked hard to earn his own salvation, but he could still not find a lasting peace. His self-righteous and headstrong attitude created rejection and conflict wherever he went. With this DVD viewers will follow Wesley's journey across the stormy seas to the colony of Georgia where he fails as an evangelist, while breaking the heart of the beautiful Sophy. Defeated, the humble Wesley returns to England in search of genuine faith and the discovery of God's grace. John Wesley is known as the spiritual father of Methodism. His passion for authentic faith expressing itself through meaningful kingdom work, his heartfelt struggles and his message of saving grace resonates with audiences of all denominations and ages. Wesley DVD was published by Vision Video in October 2010 and is our 13037th best seller. The ISBN for Wesley DVD is 727985013701. Well worth watching as introduction to both John and Charles Wesley. The locations, acting and script are good and it does 'feel' right for their time without making it difficult to watch. Recommended viewing. Got a question? No problem! Just click here to ask us about Wesley DVD. Will this Wesley DVD play in Cyprus? A:Yes this DVD will play in Cyprus, it is region 0 and should therefore play in any country. What is the region format of the DVD Wesley? What region format is the Wesley DVD? What is the running time of the Wesley DVD? A:The Running time of the DVD, Wesley is 1 hour 57 minutes.